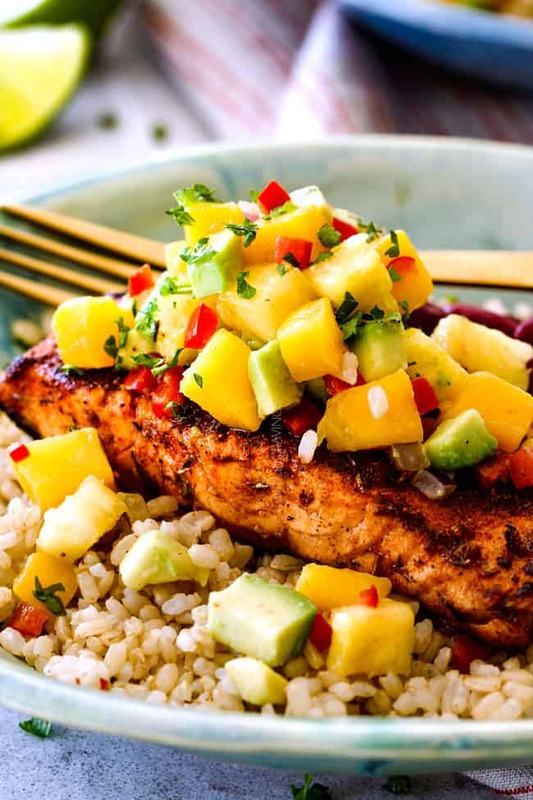 Cajun Salmon with mango,pineapple, avocado salsa is deceptively healthy, packed with flavor, easy to make, bursting with fresh ingredients and restaurant quality delicious! 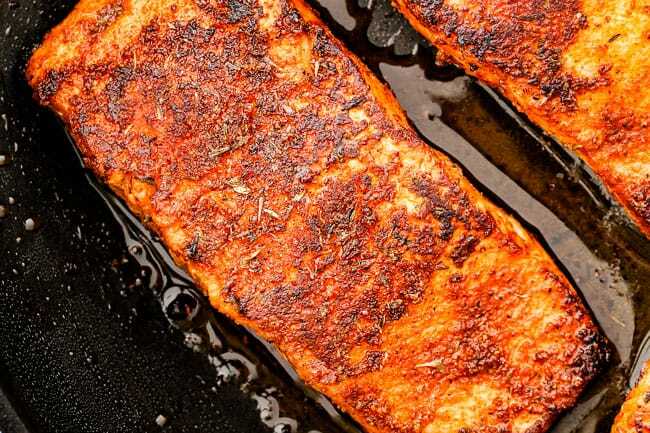 This Cajun Salmon is exploding with flavor from a simple marinade, and a dynamic Cajun spice rub and then pan seared to perfection. It’s then piled with fresh Mango, Pineapple, Avocado Salsa for the perfect complimentary fresh ying to the spicy yang. Open wide for an explosion of flavors and textures in every mouthful! 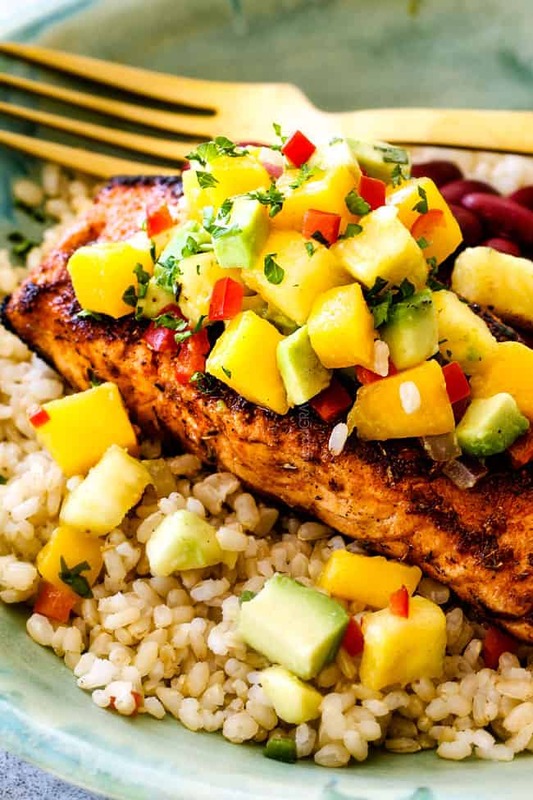 This Cajun Salmon recipe is sponsored by the National Mango Board. All opinions are my own. 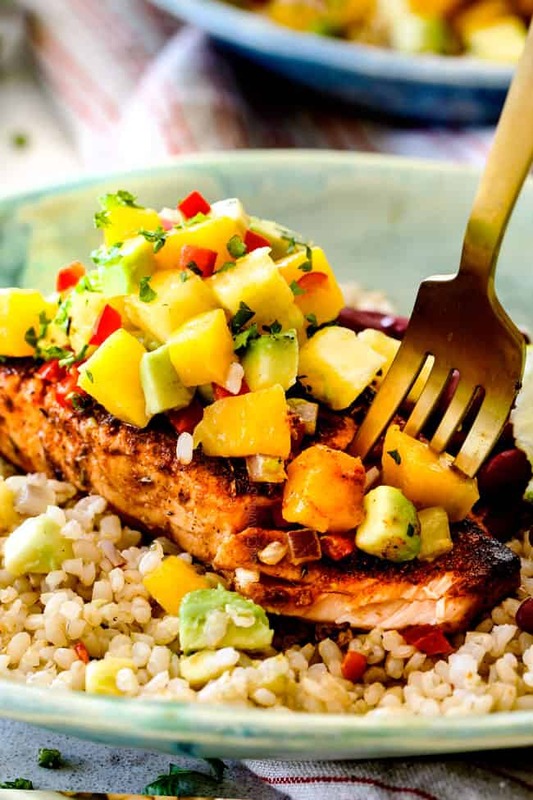 You are going to fall in love with this Cajun Salmon with Mango, Pineapple, Avocado Salsa! It tastes deceptively gourmet but is actually wonderfully easy. The salmon is juicy, rich, buttery tender and plain melt in your mouth delicious. And the best part is cooking literally takes minutes – about 3 minutes per side which makes this Cajun Salmon extra weeknight or company friendly. Simply do all the prep beforehand and when the family sits down for dinner or when friends arrive – cook for 6 minutes! 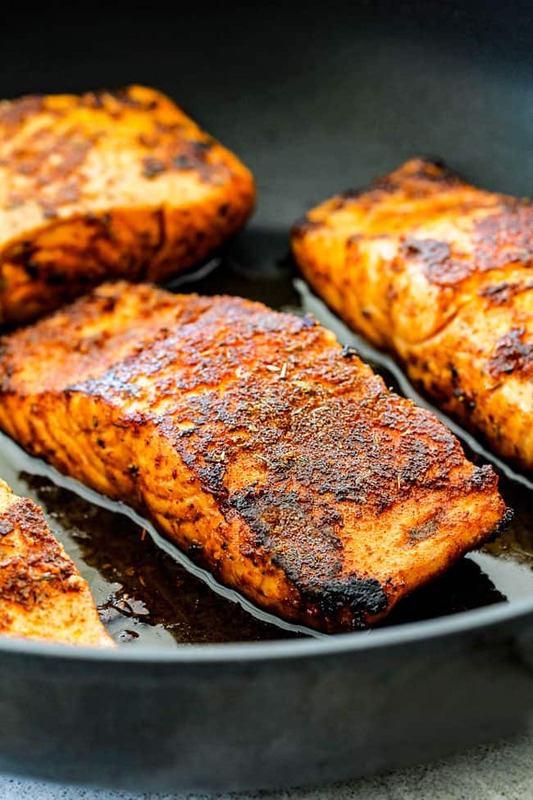 I chose to pan fry this exquisitely delicious Cajun Salmon because it creates a beautifully crispy Cajun spiced exterior with a softy juicy interior. It requires minimal effort and maximum flavor because as Gordon Ramsey always says, “color = flavor.” And this Cajun salmon has it in spades. 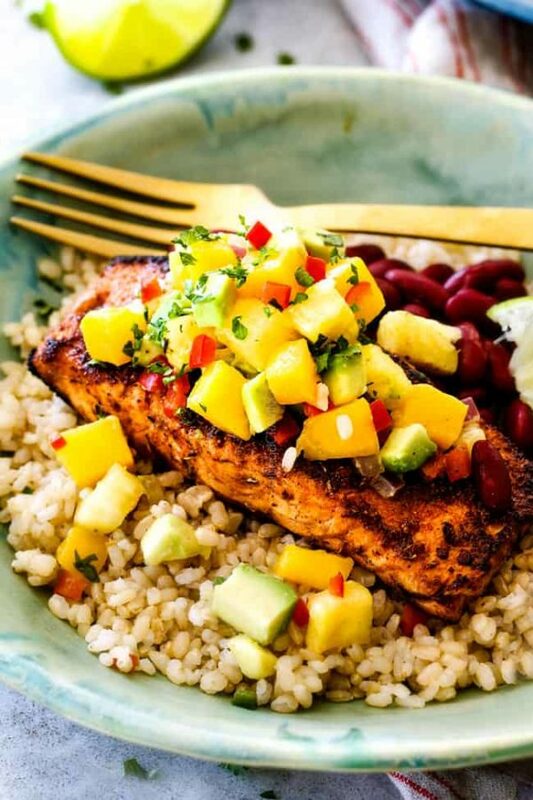 This Cajun Salmon would not be complete without the refreshing sweet, tangy, crunchy Mango, Pineapple, Avocado Salsa. It’s bright freshness cuts through the earthy, spicy Cajun seasoning to create perfectly harmonious bite after bite after bite. Marinate for more flavor: This Cajun Salmon is seeping with flavor through and through thanks to the quick marinade. 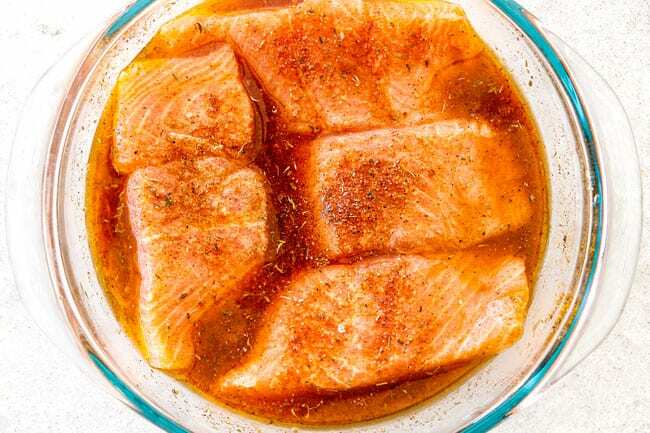 Many salmon recipes don’t marinate the salmon but this leaves all the flavor on the outside. Also, salmon should be brought to room temperature first so it cooks evenly, so this is the perfect time to marinate our salmon. Make Salsa while waiting. 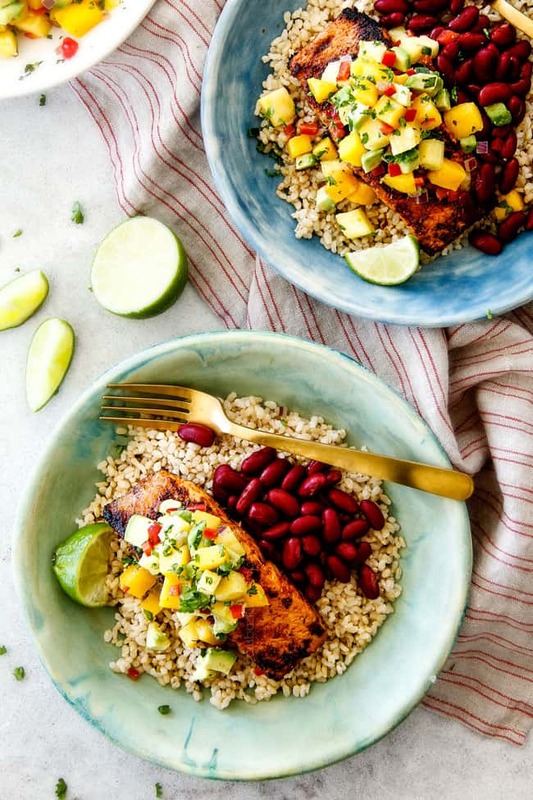 While your salmon marinates for just 30-60 minutes, you can make your delectable Pineapple, Mango, Avocado Salsa so when your salmon is ready, your dinner can be served in just 6-8 minutes! Use Homemade Cajun Seasoning: Homemade Cajun Seasoning allows you to customize the spice level and keeps you from having to run to the grocery store. If you would like less spicy salmon then omit the cayenne pepper. Use a quality nonstick skillet. This allows you to achieve nice crispy blackened crust without leaving any of this beautiful crust still in the pan from a non-seasoned pan. Eyeball the doneness of the salmon by looking at it from the side. Coral means it is rare to medium rare while pale pink will mean it is cooked through. Accurately check doneness with a thermometer, taking care to insert it into the thickest part of the salmon. It should read 120F for medium rare or 130F for medium. I prefer my salmon medium as it will cook for a minute after removing from the pan. Turn heat down: If your salmon is blackening more than your liking before it is cooked, then turn the heat down and continue to cook your salmon until it reaches desired doneness. Don’t overcook your salmon! Salmon remains buttery, juicy and tender as long as it isn’t overcooked. I like salmon medium so the inside is very moist and just cooked. It is better for salmon to be undercooked than overcooked in my opinion. Homemade Cajun Seasoning is as easy as whisking together some of the seasoning you have sitting your pantry right now. With Homemade Cajun Seasoning you can also customize the heat to your own preference and you don’t need to take another trip to the grocery store or add another jar to your spice cabinet. This Cajun seasoning is a wonderfully robust blend of smoked paprika, garlic powder, onion powder. oregano, dried thyme, pepper, salt and cayenne pepper. The pepper and the cayenne pepper are what give it the spicy kick but not too spicy. I find this Cajun Salmon has a nice kick like you would expect from Cajun Salmon but should be just the right amount of heat for most people. 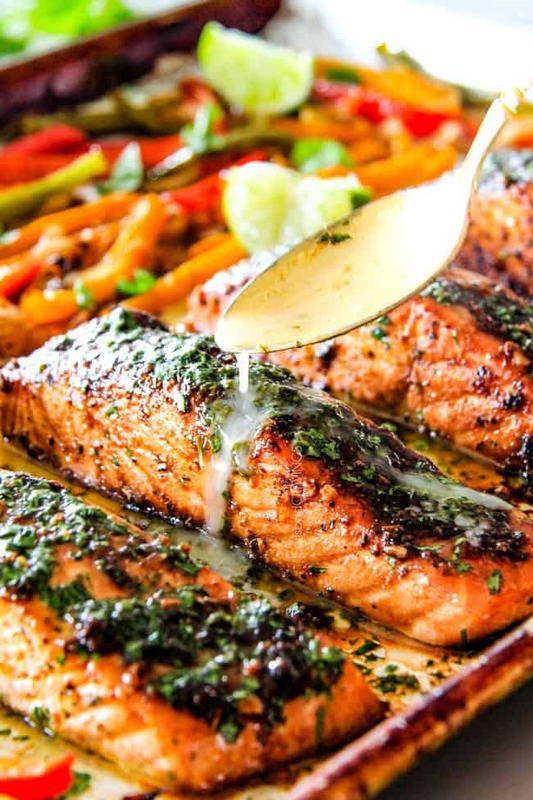 If you are super sensitive to spice, however, you can omit the cayenne pepper and your salmon will still be full of flavor without the heat. This this Mango, Pineapple, Avocado Salsa is the trifecta of paradise – in one salsa! The sweet and tangy pineapple, sweet and juicy mango, creamy buttery avocado with crunchy bell peppers, zingy red onion, citrussy cilantro, kickin’ jalapeno and tangy lime – it simply doesn’t get more refreshing delicious. This Mango, Pineapple, Avocado Salsa is so good, you can eat it with a fork or chips and makes a star garnish for grilled chicken, pork or fish. This salsa is pretty straightforward to make and only requires your chopping skills. I like to make the salsa ahead of time as it tastes better chilled and the flavors have more time to meld. 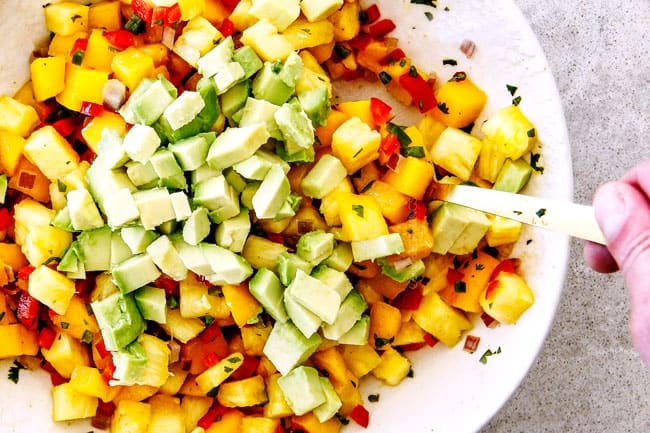 If you make the Mango, Pineapple, Avocado Salsa ahead of time, then simply chop all of your ingredients and add them to a bowl EXCEPT the AVOCADO. When it comes time to serve, drain off any excess liquid then stir in your avocado just before serving so it doesn’t brown. If you’ve been following me for anytime at all, you know mangos are one of my favorite foods of all time. They are naturally sweet and juicy making them delicious all on their own or fabulous in salads, salad dressings and stir fries. Not only are mangos fabulously delicious, they are a natural superfruit that contain 20 different vitamins and minerals, and are fat free, sodium free and cholesterol free. Thankfully this goodness can be enjoyed year-round thanks to the six varieties of mangos that have staggered growing seasons in Mexico, Peru, Ecuador, Brazil, Guatemala and Haiti. To check for mango ripeness, focus on FEEL not color because every variety is a different color when ripe. For example, red doesn’t necessarily mean ripe. Squeeze gently to judge ripeness. A ripe mango will give slightly, indicating soft flesh inside. Use your experience with produce such as peaches or avocados, which also become softer as they ripen. Ripe mangos will sometimes have a fruity aroma at their stem ends. 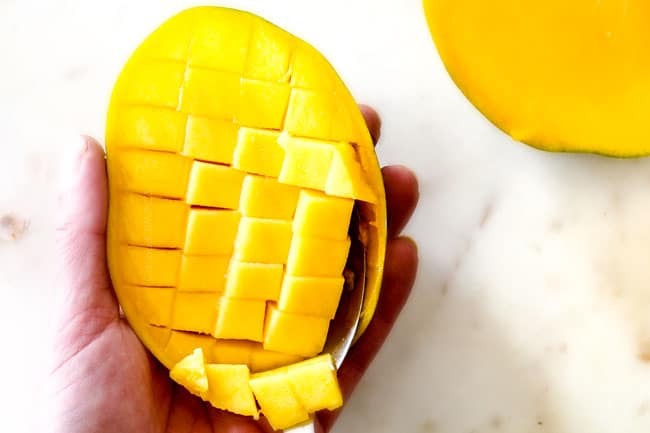 If you aren’t sure how to cut a mango, don’t be shy, it is much easier than you might think! Check out my detailed tutorial on How to Cut a Mango. What can I serve with this Cajun Salmon? 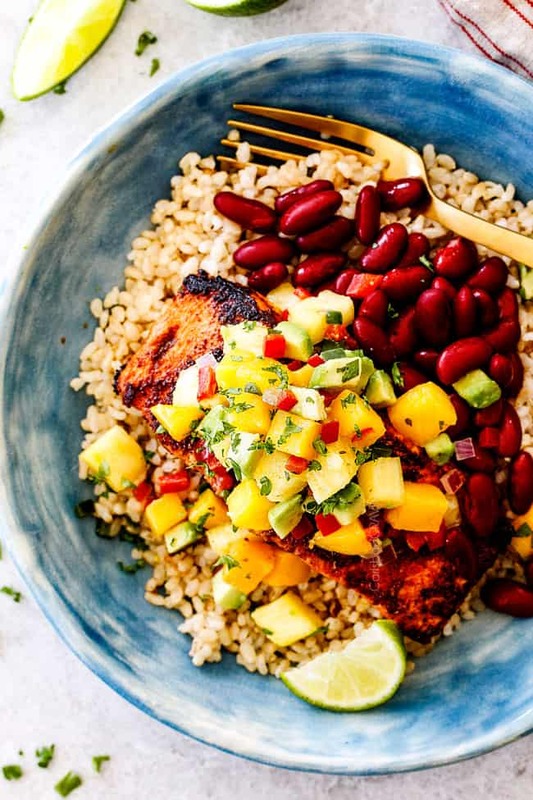 Now it’s time to make this Cajun Salmon with Mango, Pineapple, Avocado Salsa – spicy, fresh, healthy tantalizing dinner with layers of multi-dimensional flavors and textures in every bite. Want to try this Cajun Salmon Recipe? Pin it to your SEAFOOD, SALMON Or DINNER Board to SAVE for later! 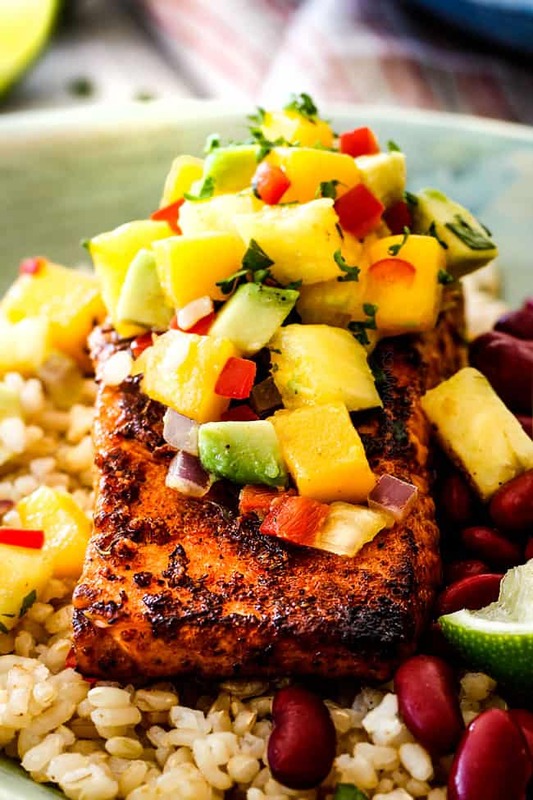 Cajun Salmon with Mango, Pineapple, Avocado Salsa is deceptively healthy, packed with flavor, bursting with fresh ingredients and restaurant quality delicious! 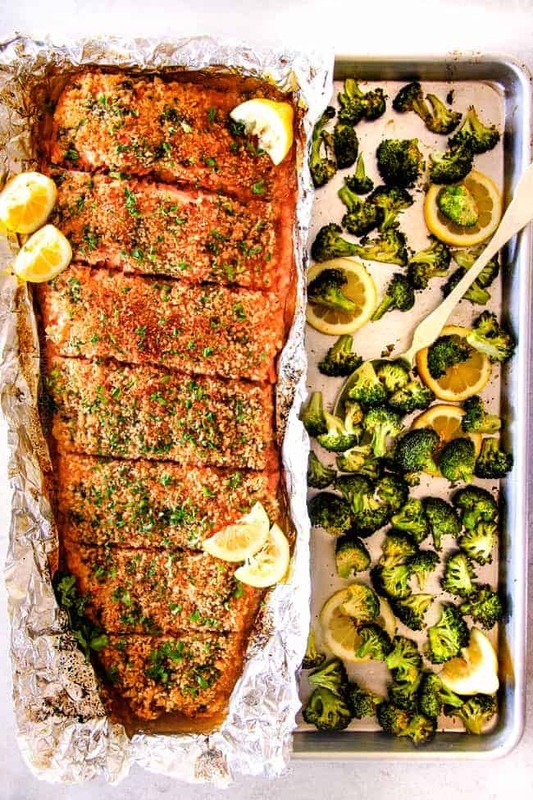 This Cajun Salmon is exploding with flavor from a simple marinade, and the most flavorful Cajun spice rub and then pan seared to perfection. It’s then piled with fresh Salsa for the perfect complimentary fresh ying to the spicy yang. Open wide for an explosion of flavors and textures in every mouthful! 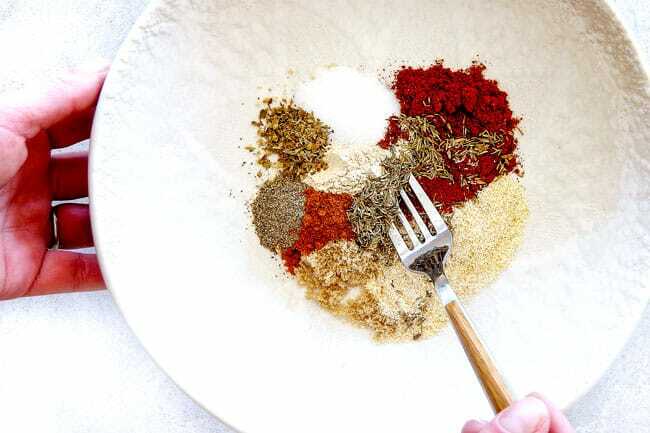 Marinade: Mix together all of the Spice Rub ingredients in a medium bowl. 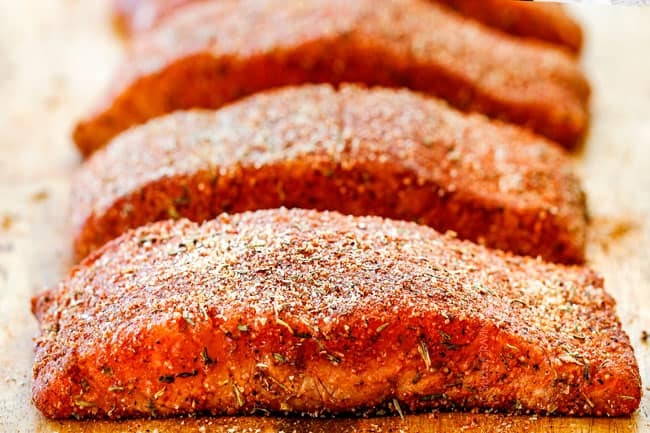 Remove 2 teaspoons Spice Rub to a shallow dish or large freezer bag (whatever you are going to marinate salmon in). Whisk in remaining Marinade ingredients. Add salmon and turn to coat. Marinate at room temperature for 30-60 minutes. You will use remaining spices later in the Rub. Mango, Pineapple Avocado Salsa: Meanwhile, chop and add all of the Salsa ingredients EXCEPT AVOCADO to a large bowl. Toss to combine. Refrigerate until ready to serve. Chop and add avocado just before serving so it doesn’t brown. Spice Rub: After 30-60 minutes (no more), remove fish from marinade and pat dry. Rub remaining Spice Rub evenly all over fish. The easiest way to do this is dip each fillet in the spice rub, front and back. Cook: In a large nonstick skillet, heat 1 tablespoon olive oil over medium-high heat (medium if your stove runs hot). Once hot, add fillets, turn heat down to medium and cook approximately 4 minutes, until crispy and blackened. Flip salmon over and add butter. Cook an additional 3-6 minutes to your liking (will depend on thickness). Check salmon after 2 minutes to ensure it isn't cooking too quickly - if it is, then turn down the heat. Serve: Remove salmon from skillet to individual plates and drizzle with pan juices. Serve with Mango, Pineapple Avocado Salsa. Looking for More Salmon Recipes? I am so excited for this one! I think I’ve made all your salmon recipes and they have all been home runs! This is going on the menu this week! That is so awesome Sally you have made all of my salmon recipes! I am excited for you to try this one as well – I think you’ll love it! I am always looking for new ways to prepare salmon and this looks incredible! Thank you so much Lauren, I hope this is a new favorite! WOW this looks sooooo good! I love the combo of fresh and spicy! That is one of my favorite combos too – can’t wait for you to try it! Thanks Ginny! This is one of the most amazing meals I have ever made! The Cajun salmon was delicious! The fruit salsa was perfect with it. I served it with your Roasted Asparagus with Balsamic Brown Butter, except made green beans instead of asparagus. Again, so delicious! I loved waking up to your comment this morning Jessica, thank you so so much! I am thrilled you made it already and loved it so much! It sounds perfect with Balsamic Brown Butter Green Beans – yum! Thank you for taking the time to make my day! This is EXACTLY the flavor combo I’ve been dreaming of since I first started recreating my favorite mango salsa! THANK YOU for the inspiration! I baked my salmon and added some chili lime seasoning to Cajun mix, but I’m sure the flavor profile is similar. I had to show more restraint than I knew I had to not eat more than my serving.